In Year 1 you will find 30 enthusiastic, kind, smiling, hard working superstars! Our teacher this year is Mrs Marshall. Our Teaching Assistant is Mrs Taylor. In our class you will also meet Mrs Biltcliffe and Miss Latham. We are developing a Growth mindset and our motto this year is ''We believe'. We are not afraid to make mistakes as we know we can learn from them. We believe anything is possible and in Cello class we are all Superhero learners. We always start our busy day with a English and Maths morning challenge to get ourselves ready for learning. When we work hard and try our best we earn lots of gold coins and Dojo points. We appreciate all the support from parents and grandparents who help us practice our spellings and hear us read so we can become even cleverer! Our PE lessons are on a Wednesday and we have swimming lessons on a Friday morning. To find our Theme overview please click here. For Maths Day we enjoyed solving dinosaur themed word problems. Our main challenge to solve was called Dinosaur eggs. ‘Three dinosaurs laid some eggs. Each dinosaur laid an odd number of eggs. Altogether they laid 19 eggs. How many eggs did each dinosaur lay?’ We had to find different ways to solve the problem. We found lots of ways to solve the problem. The children had a fantastic day on World Book Day where we focused on the story of Alice in Wonderland. Every child looked brilliant in their costumes. We enjoyed going down the rabbit hole and making jam tarts. We designed our own eat me drink me shrinking potions. Our favourite part of the day was our Mad Hatter’s Tea Party when we ate our jam tarts and some more cake! Some of us enjoyed sharing a story with our parents or siblings. The next day we wrote a detailed recount all about our fun Book Day. First we have travelled back in time in a TARDIS! We loved listening to Mrs Gant talking about when she was a little girl. She brought some wonderful toys for us to look at. In our film studio we learnt how to take our portrait and made an iMovie of our lives. It was very exciting seeing ourselves moving on screen. We used our iMovie and timeline to write about our life so far. As part of our theme work we planned and designed a fruit salad, then we chopped the fruits carefully (with help) and made our fruit salads. We all enjoyed eating our fruit salads. We definitely had our 5 a day! We also tasted some more unusual fruits and thought of good adjectives to describe their tastes. We did not all like all the fruits but we were brave and tried them! In our English work, we have enjoyed learning about instructions. We followed instructions to make paper aeroplanes, painting flowers and making jam sandwiches. We wrote our own instructions to make jam sandwiches and our fruit salads. We have used time connectives and bossy verbs. We have enjoyed a plant hunt, we have learned about the parts of a plant and what parts of a plant we can eat, we know all about the life cycle of trees and what happens each season and we had fun printing using vegetables to make a flower. On Safer Internet Day we enjoyed listening to a story about 2 friends called Zap and Zoom, they liked playing games online with each other. Luckily they were both sensible and asked permission before they went online and asked for help when they were unsure what to do. We looked at what symbols for yes and no would look like on the computer so we would know to be careful when pressing any buttons. We drew what we thought the internet looks like and discussed what personal information is. We played a game called keep it safe or give it away. We now know to keep our personal information safe, such as our name, address, school and passwords. Then we learnt about permission, making sure we ask permission when we go online, by enjoying a game to ask permission before we threw someone a beanbag. At our Christmas party we enjoyed dancing, playing party games, playing pass the parcel and a very special visit from Father Christmas. For Enterprise week we made Christmas biscuits. Our company was called 'Jingle Bells Biscuits'. We successfully pitched to Mr Upton and secured our £30 so we could buy all our ingredients. We had fun making and decorating the biscuits to sell at our Christmas Fair. At the fair children also had the opportunity to decorate their own biscuits. We all enjoyed helping sell our biscuits on our stall. 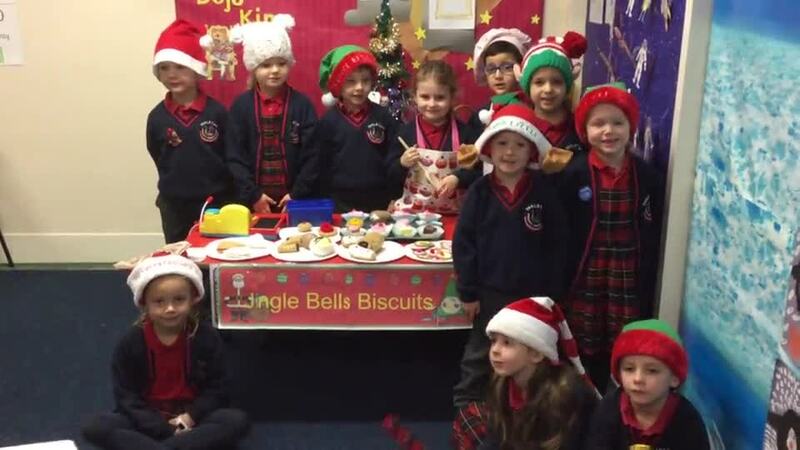 We hope you like our advert advertising our biscuits made by Santa's little helpers! We have had the fantastic opportunity to enjoy the Narnia experience at Hesketh Bank Christian Centre. All the children (and adults)loved walking through the infamous wardrobe. It was great to see the look on the children's faces once they arrived in Narnia, which really felt cold! In our English work this half term we have enjoyed reading lots of dragon stories. We are writing our own innovated story of Zog by Julia Donaldson. Our classroom has currently been invaded by dragons, thankfully friendly dragons. The children all made fantastic dragons at home and brought them to school to inspire their character writing in their own dragon stories. We enjoyed learning all about the importance of Remembrance and D-Day. The children showed great empathy and understanding with the soldiers, expressing great ideas for what they thought the soldiers and their families would have been thinking and feeling. We made our own poppy wreath which we presented during Double Basses assembly. We also made a beautiful fingerprinted Dove of Peace. We enjoyed our ramble to the woods where our family sponsored us for the great cause, Children in Need. The sun was shining for our ramble and some of us were able to ramble with our parents or grandparents. Our theme this half term is Penguins, Possums and Pigs. We have enjoyed drawing, painting and making lots of penguins. We have created a clay penguin, learned how to do an observational drawing and shade using pencils, had fun using water colours to paint an Emperor Penguin and made a penguin collage. We enjoyed using different brushes and mixing the paints. We were able to concentrate really well when we were being artists so all our work is really good. We really enjoyed our trip to Blackpool Zoo where we saw lots of our favourite animals and found out even more information about all the animals. In our English work we have written a non-fiction book all about penguins and we are now penguin experts! We are also wrote our own story based on the book 'Lost and Found' by Oliver Jeffers and had fun roleplaying this story in our outdoor area.